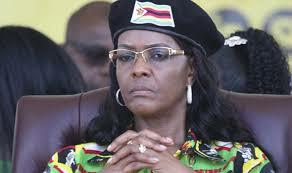 FORMER first lady Grace Mugabe’s controversial University of Zimbabwe (UZ) Doctor of Philosophy degree, which was finally published last week almost four years after graduation, has been described as a mere compilation of plagiarised text and quotations, making it the biggest academic fraud of the century. The 226-page thesis, titled The Changing Social Structures and Functions of the Family: The Case of Children’s Homes in Zimbabwe, was published on the UZ website under her maiden name “Ntombizodwa G. Marufu”. Grace married Mugabe in 1996. The online publication of Grace’s research follows a petition by Sociology Department academic staff last month. The lecturers described the awarding of the doctorate as “scandalous”, saying it violated the established procedures and policies of the country’s oldest university. The Sociology Department, in a petition delivered to the Zimbabwe Anti-Corruption Commission (Zacc), said Grace’s degree did not go through processes that other candidates are subjected to, thus describing it as “very suspicious”. However, in a curious reversal, Zacc said it was no longer investigating Grace’s degree amid indications of deep divisions among commissioners over the issue. The inordinately long period it took the university to publish the thesis on its website raised eyebrows, with questions of impropriety swirling around. Social Commentator Maxwell Saungweme described Grace’s PhD as the biggest academic fraud of the century. “It’s not a PhD thesis but a mere compilation of plagiarised text and quotations from grey literature, newspaper articles, television and radio programmes. It does not contribute original ideas to knowledge. It also cites prominently very old sources such as 1978 and 1985 works. A lot of scientific reviews have been done to this literature, and academic work must cite recent scientific journals and books,” Saungweme said. He said Grace’s “jumbled up” piece would not even meet the standards of an undergraduate submission. “This scandal in itself is a disgrace to the Sociology Department, UZ and Zimbabwe,” Saungweme said. A Rhodes University sociologist, Professor Kirk Helliker, in an article published by South African newspaper the Mail & Guardian, said Grace’s thesis does not meet the minimum standard for a PhD. “Having done a deep read of the thesis, it seems that the thesis does not meet the minimum standard for a PhD thesis, based on examiners. For a PhD thesis, some kind of original contribution needs to be made to prevailing academic knowledge. Thus, examiners ask: ‘What new knowledge has been created (theory/method/policy/practice)?’,” Helliker said. Helliker said while every PhD thesis has its own strengths and weaknesses, such that there may be only one main contribution, it is vital to realise that PhD theses are expected to reach a minimum standard in relation to theory, research methodology (and methods) and empirical discussions. “One important way of evaluating the Grace Mugabe thesis is with reference to originality and, for me, it is the most insightful way. Of course, other issues are pertinent such as plagiarism. A sophisticated software programme is not necessary to check plagiarism, though it is able to quantify it: copying and pasting discussions from the thesis onto Google, and checking what comes up, is an easy alternative. I did that once, and it was illuminating,” Helliker said.